Editor’s note: Baseball is back and Yahoo Sports is previewing all 30 teams over the next month. This year’s previews will focus on fantasy and reality, as our MLB news staff and our fantasy baseball crew come together to assess each team before opening day. Next up, the Los Angeles Dodgers. After two straight World Series trips and zero World Series wins, the Los Angeles Dodgers had quite the interesting offseason. They traded Yasiel Puig and Matt Kemp to the Cincinnati Reds. They signed A.J. Pollock. They watched Manny Machado and Yasmani Grandal leave. And they didn’t sign Bryce Harper. Beyond that, their GM Farhan Zaidi left to become the team president of the rival San Francisco Giants. The 2019 Dodgers will be different in a lot of ways, but they’re all still very much the same. They’re depending on Justin Turner’s bat, Kenley Jansen’s arm and they’re worried about Clayton Kershaw and Corey Seager’s health. They have a lot of pitchers, but still not a real clear path about who are their best five. They could be well served by a Cody Bellinger bounce-back, and a full season from the oft-injured Pollock. The good news is, they’re still the team to beat in the NL West, and only injuries should stop them from another division title. But that injury potential certainly looms — especially with Kershaw, who we already know won’t be ready for opening day. The fantasy side is equally cloudy. There’s a lot of talent, but also many of the same questions. 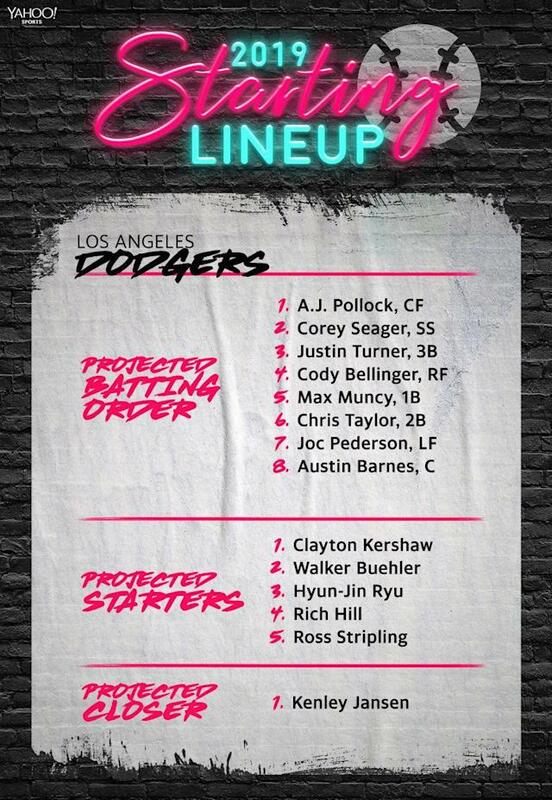 If Kershaw, Seager and Pollock are healthy, they’re certainly people you want on your team. But if you’re risk-averse, the Dodgers might be quite the test. This offseason is a tough one to grade. The Dodgers of the past few years have built themselves on depth — having six outfielders and playing matchups like crazy. The Puig and Kemp trade seemed to indicate that’s not necessarily going to be the strategy anymore, filling the outfield gap with Pollock. The Dodgers also lost a bit of starting pitching depth by including Alex Wood in that trade. The Dodgers got back two prospects and Homer Bailey, who they then released, so it wasn’t about immediately about making the big-league club better. Fact is, the Dodgers have plenty of talent and keeping the farm system stocked also behooves them. They could have made a play for Harper or still could for Dallas Keuchel, but the Dodgers are hoping players like Bellinger and Julio Urías step up instead. Our grade: C- — It wasn’t thrilling, or particularly bold, but the Dodgers are clearly trusting who they have. Who will be the best fantasy buy for Los Angeles? What is the biggest fantasy question for Los Angeles? Outfielder Alex Verdugo will be in the majors for most of the season, but given the Dodgers’ affinity for mixing and matching, he likely won’t see regular playing time. Baseball America compared Verdugo to Nick Markakis, so expect a high average with decent power. 1. 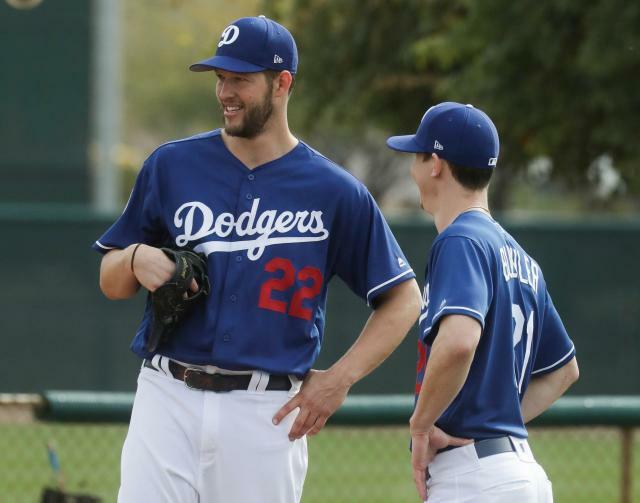 Clayton Kershaw gets right: Kershaw's health has become a source of constant concern for Los Angeles. After missing time the last three seasons with various ailments, now it's his left shoulder that isn't feeling right. That's a big red flag for a team with championship aspirations. The good news is Walker Buehler seems destined to be an ace, if he isn't already. The concern is that Ross Stripling, Rich Hill, Hyun-Jin Ryu and Kenta Maeda all have varying degrees of questions surrounding them. A limited or outright injured Kershaw would put a huge dent in their hopes. 2. Corey Seager's return: The two-time All-Star shortstop was limited to 26 games last season after undergoing operations on his right elbow and left hip. Now the question is just how effective he can be in 2019. Seager was a game-changing talent and was arguably the centerpiece of L.A.'s lineup his first two full seasons. With Chris Taylor serving as the only insurance, the Dodgers are banking on and will absolutely need him to be a game-changer again. The theme for the Dodgers this year is believing in the roster they’ve built over the past few years. There were more departures than arrivals. Certainly not the big-ticket offseason you might expect from a club of their magnitude. They’re going to live and die with what they have. Tupac would be proud.